Look at other tabs too. Develop for Bluetooth 5 Low Energy ! Anybody who seriously undertakes the development or testing of Bluetooth 5 LE devices is of the need to have a tool which displays the Bluetooth LE packets as they happen in the air. To see their content, timing, mutual relations, all relevant statistics. Frontline SODERA LE is exactly such an instrument, tailored on the distinctiveness of Bluetooth LE protocols. It builds up on Frontline's 16+ years experience in Bluetooth protocol analysis technologies and markets as well as on the continuous observance of and participation in Bluetooth SIG specifications development. 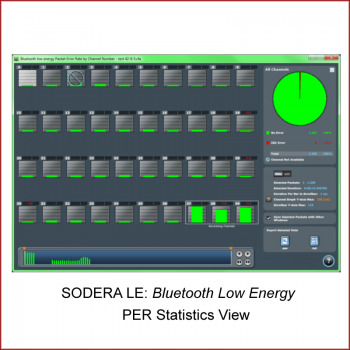 Even programmers of more complex or certified Bluetooth software, control systems, and other advanced applications make use of SODERA LE to check and oversee that their systems are well designed and safely confined within available communication resources under the conditions of larger systems, heavier external traffic or interferences. 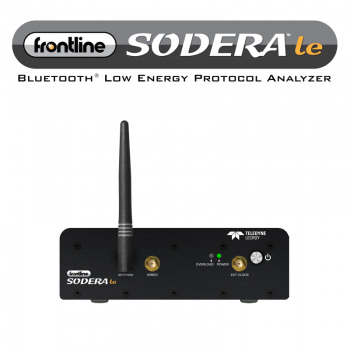 SODERA LE is a wideband Bluetooth protocol analyzer capable of sniffing all Bluetooth low energy channels simultaneously. 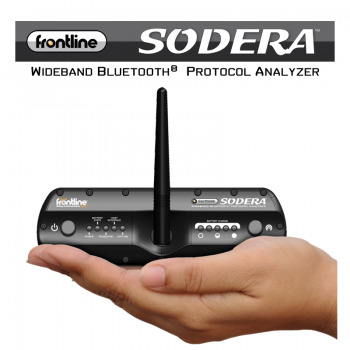 SODERA captures the traffic of all Bluetooth LE devices (nodes) within the range, regardless of the topology or the used protocols. 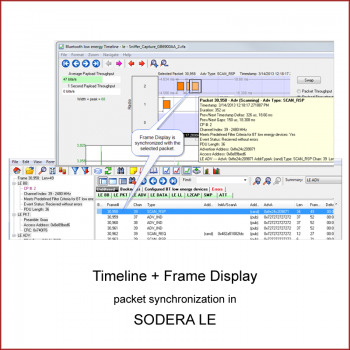 It passes detected packets on to the Frontline software for intricate analysis and comprehensive review. 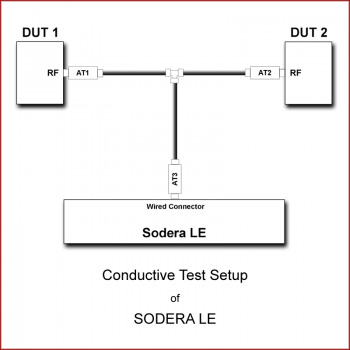 SODERA LE uses a software defined radio technology, which even gave it the name. The Bluetooth low energy specification is rapidly being updated with modifications that enable ever new "Internet of Things" (IoT) features for our connected world. 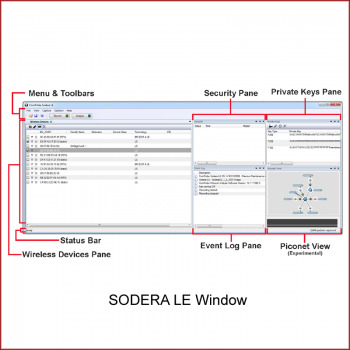 The choice of SoDeRa technique provides the flexibility to keep up with specification changes and to protect your investment. 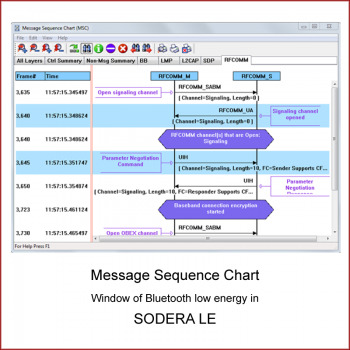 No matter what twists and curves the technology brings, developers using SODERA LE will be able to efficiently and effectively develop and troubleshoot their Bluetooth low energy enabled devices or software. these are stored in the SODERA LE unit. 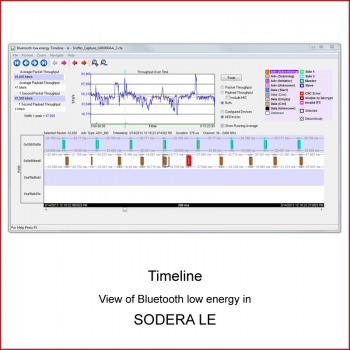 SODERA LE allows development and testing of High Speed (2Mbps), Long Range (4x), Extended Advertising (800%) of Bluetooth 5 LE and of related Bluetooth mesh technology . Recording. BD_ADDRs are listed. Select (filter) active devices which you want to Analyze. Analyze. Either live or from the record. The major results of the analysis are available in three different views: Frame Display, Blutooth low energy Timeline and Message Sequence Chart, each serving different needs. Bring quickly your LE device to a market. 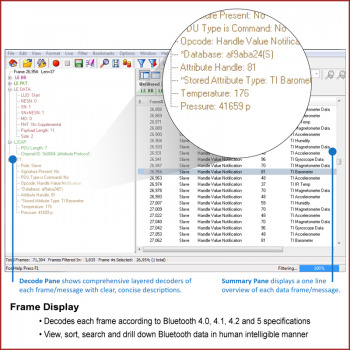 Frontline supports all latest adopted Bluetooth specifications, profiles and protocols. You can see a complete set of new, updated, and pending specifications, profiles and protocols on the the Bluetooth SIG website. Frontline also supports some of the emerging profiles and protocols to take advantage of the ongoing advances in wireless communications. Sodera LE covers all of these specifications which belong to the new Bluetooth LE category, ie. which are not based on BR/ EDR capabilities (Bluetooth Classic).